Pharmacologists, Herbalists, Researchers, Students Medical and Healthcare Professionals to Exchange Ideas Knowledge and Networking at its 100+ International Conferences, Natural Compounds Associations and Societies, business professionals, Postdoctoral fellows and Trainees. Natural Compounds 2019 will educate the public with recent advances in Pharmacology and Chemistry of Natural Compounds around the world and to sharpen the related ideas about Natural drug research. Moreover, Natural Compounds 2019 provides you a great networking with peer network. Also, Natural Compounds 2019 includes, 10+ Keynote Speaker Session, 50+ speaker faculty over 2 full days sharing Evidence Based, 5+ Workshops, 13 Interactive sessions, Mixture of Health care units and Academia Delegates, Networking provide a dedicated forum for the advancement, execution, and exchange of information about Pharmacology and chemistry of Natural compounds. 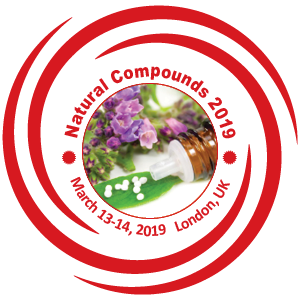 PULSUS which organizes 1000+ Global events every year is delighted to welcome all the enthusiastic participants across the world to its prestigious Natural Compounds Conference named “2nd World Congress on Pharmacology and Chemistry of Natural Compounds” which is going to be held during March 13-14, 2019 at London, UK. Natural Compounds 2019 highlights the theme “Accelerating Innovations & fostering advances in Natural Drug Research”.